Still in use today, the Tin Hau Temple at Causeway Bay in Hong Kong is an excellent example of 18th century temple architecture. The city of Hong Kong is filled with more than 600 temples, about half of them Buddhist. On a Crystal Cruises excursion that introduced us to various aspects of everyday life in China, we visited one of these temples, the Tin Hau Temple located in the Causeway Bay area of the city. Declared a monument in 1982, this preserved temple is considered to be representative of early 18th century temple architecture. Although termites substantially damaged the wooden structure over the years, it has been faithfully restored. There are some 70 Tin Hau temples remaining in Hong Kong. The temple is located on reclaimed land that was once a coastal fishing village. Historians believe the Tai family first settled in Kowloon and used to come here to gather grass. When they found a small statue of Tin Hau (the goddess of the sea that watches over sailors and fisherman) in the rocks, they built a shelter for her that became so popular with local fisherman that they collected donations to make it a proper shrine. It was thought that the goddess was able to predict storms. From the street, we descended a flight of winding stone stairs to reach the structure that was built and is still managed by the Tai family. The temple is small and intimate with a traditional green tile roof that stands out against the grayness of the surrounding buildings. Consistent with other Buddhist temples, the décor employs three primary colors: red, yellow and green. As you enter, the large room in the center is heavily scented with burning incense. Tin Hau still appears to be an integral element of the surrounding community. As we visited, locals were walking in and out to worship, lighting incense and having their fortunes told. The building was filled with statues, offerings and wall hangings, and had slow-burning coils of incense handing from the ceiling. Like much of vertical Hong Kong, the Causeway area is densely filled with high-rise buildings that seem to reach the sky. Now housing a major shopping and residential area, it is considered one of the most expensive places in the world to live, perhaps even more expensive than Fifth Avenue in New York. 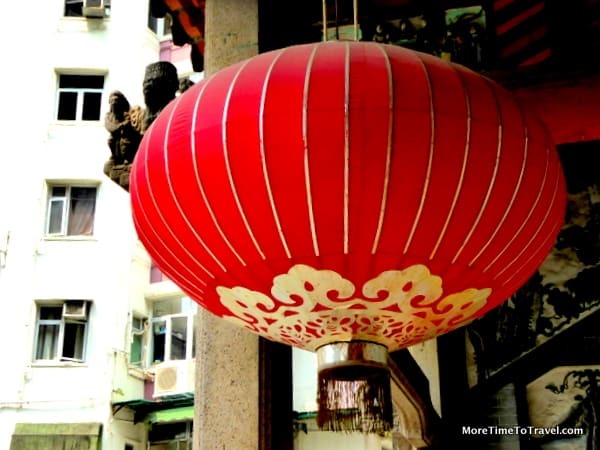 Open to the public from 7AM-5PM at no charge, Tin Hau Temple is located behind Victoria Park in Causeway Bay, within walking distance of the Tin Hau MTR train station.